Today, October 22nd, we find a unique intersection of three heroes – three men who should serve as inspiration for any virtuous leader. Today marks the first anniversary of the attack on Parliament Hill in which Cpl. Cirillo gave his life for his country. He stood as an honour guard at the National War Memorial in Ottawa and was killed by an assailant who later went on to storm the House of Commons and endanger the lives of many people. While some might suggest Cpl. Cirillo was just in the wrong place at the wrong time, in many ways the symbolism of his death highlights something very right. He is a model of honour and service. In the midst of this very difficult experience, Vickers truly demonstrated what we as leaders aspire to: depth of courage and profound understanding of dignity. He shared these experiences in a speech he gave at Mount Allison University where he was presented with an honourary degree. To read the full, incredibly moving account, see the CBC story below. Today, Oct 22nd the Catholic Church celebrates the Memorial of Saint John Paul II. In 2014, he was canonized by the Catholic Church and declared a Saint: a model of Christian virtue and holiness. 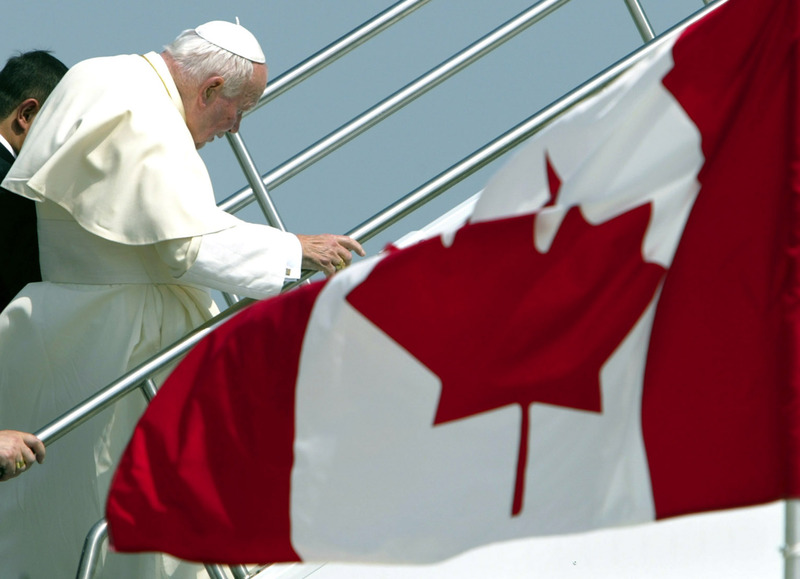 In 2002, John Paul II came to Canada for the World Youth Day rally. It would be his last. In his closing message of the final Mass in Toronto, he called young people to greatness and spoke out of his own experience and difficulties he endured as a leader. 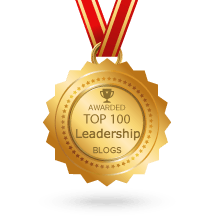 At the foundation of strong leadership is the virtue of hope. Hope for the world and hope for each individual. These three heroes linked to October 22nd are truly models for all of us of who seek to become virtuous leaders. May we emulate what they embody. 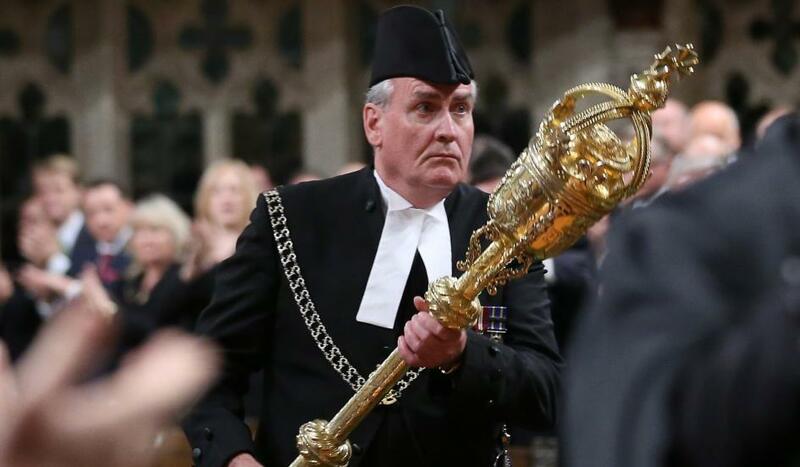 Former House of Commons sergeant-at-arms Kevin Vickers opened up Monday about the intense emotion he experienced in the aftermath of his confrontation with a gunman in a hallway on Parliament Hill last October. Vickers, who was being presented with an honorary degree from Mount Allison University in Sackville, N.B., told the audience he woke up crying at 5:30 a.m. the day after the shooting. “It was the loneliest moment of my life,” he said. Vickers ended up fatally shooting the gunman, who had earlier killed a ceremonial guard at the War Memorial and shot a constable at the Peace Tower entrance. He told the graduating class about how he was “instantly enamoured” with Parliament Hill when he went for a job interview to be the director of security for the House of Commons and saw a father and son playing Frisbee on the lawn. A year later, he was selected to be the sergeant-at-arms. During the attack, Vickers found himself on one side of a pillar and the gunman, on the other side — so close, “there was a moment where I thought I’d just reach out and grab the gun,” he said. But the gunman fired, so he dove through the air, landing on the floor beneath him. “I bumped up against a moment in history,” he said. Vickers, the new Canadian ambassador to Ireland, dedicated his speech to mothers. He says his own mother insisted he come home to Miramichi after his act of heroism on Parliament Hill. She called him three times before he finally relented and hopped in his truck, he said. It was during the overnight drive that he thought of his father, who had taught him that “regardless how repulsive the crime, you always respect the dignity of the person,” that he decided he should pray for the gunman, he said. Vickers immediately arranged for the local priest to say a mass at his family home, during which his mother prayed for the mother of Cpl. 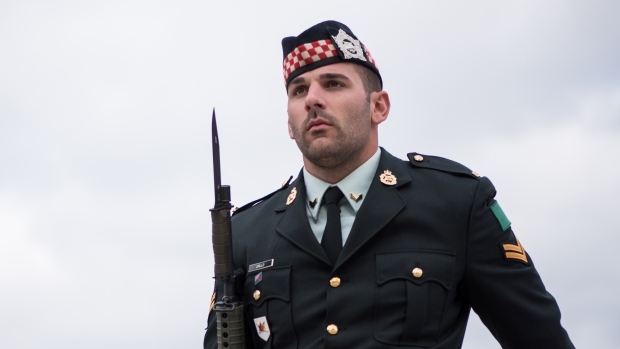 Nathan Cirillo, who was killed standing sentry at the National War Memorial, and the mother of Michael Zehaf-Bibeau, who gunned down the soldier. It was there, at that mass, surrounded by his extended family, that Vickers also said a prayer for Zehaf-Bibeau. “It kind of occurred to me that [Jesus], after he was crucified, the first person he let into the kingdom of heaven was the man crucified next to him — a convicted criminal,” he said. 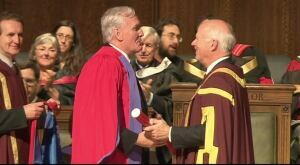 Vickers was being presented with an honorary degree by the chancellor of Mount Allison University, the CBC’s Peter Mansbridge. An honorary degree was also awarded to Acadian author France Daigle on Monday.